I hate to admit it, but this is one of those books that makes me feel stupid, because I think there's a whole layer of the story I'm missing. 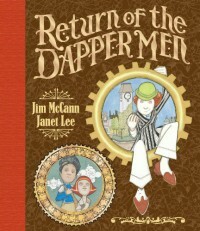 I got the references to Shakespeare, and the nursery rhymes, but who were the Dapper Men supposed to be? Why were there 314 of them? Why was 41 different? Why didn't Zoe talk? Argh.Anyway, the story about growing up, about remembering yesterday and looking forward to tomorrow, is good, and the art by Janet Lee is simply fantastic. My only quibble is what with what seems to be intentional obscurity on the part of the author. It is as if he set out to make the book mystifying in an effort to say "Look how clever I am!"